THE CLOUD OF SUB-PRIME CRISIS JUST GOT HEAVIER, DARKER AND LARGER. The New York Times reported that the Federal Government may assume direct control of the two of the biggest mortgage-finance companies in the US to bail them out: Fannie Mae and Freddie Mac. These two have nearly 45% of mortgage market share between them, and could potentially tank about USD 5 trillion if they go down. On the other hand, the bail-out of this magnitude might blow away credibility of USD, and imperilling the Fed budget. There is a sense of politics being involved since the NYT report of "nationalization" came out earlier this week. This further took a large chip off the share prices of both and the decline continued for the whole week in spite of confident building reports from the promoters. 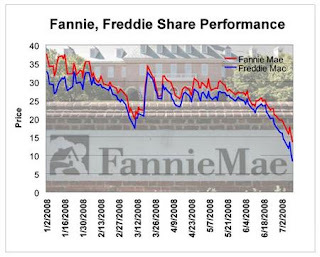 Fannie Mae's stock, for one, has lost most of its value, swooning from peaks around $70 in August 2007 to their current $9 per share in July 2008 - a steep nose-dive of net-worth. This crisis is not "for dummies" for sure. The nature of economy is global with respect to credit/liquidity and oil - the two primary trade elements. Any movement within a given sector or region of these two is propagated all around. It is only a matter of time before the crisis-call reaches the so called developing economies. The globalization is a giant beast of a dinosaur, as it were, so huge that it could have taken about half an hour for a shoe-bite pinch to reach its brain and give out a scream. Economists have piece by piece deconstructed the "positive" outlook of stability and insulation of the economy that was recently given by the Governor of the Reserve Bank of India. One may argue that the early warning signs are already up: inflation rates have doubled, and the growth rates have halved for H1 of the current fiscal for India. 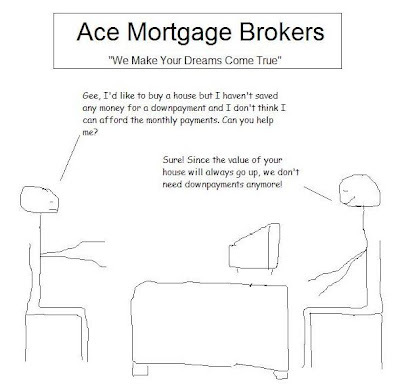 The numbers that are coming out are overwhelming, and before it really gets too complicated I thought it worthwhile to educate myself, yet again (see links below): to begin with, how the sub-prime crisis came about in the first place.